Marcel Kittel (Argos-Shimano) cruised to victory in the opening stage of the 2012 Eneco Tour, between Waalwijk and Middelburg, at the end of a long stage across the flatlands of the southern Netherlands. The German sprinter, who was forced to quit the previous month’s Tour de France through illness and injury, was led to the line perfectly by his team to take victory at a canter. World under-23 champion Arnaud Démare (FDJ-BigMat) was second, a length behind Kittel, with double Olympic fourth place Taylor Phinney (BMC Racing) in third, after a number of the big sprinters were left behind a crash that hit the middle of the peloton with two kilometres to go. "We have delivered a strong example of teamwork; everyone could see that," said Kittel afterwards. This was my first race after the Tour de France. I was off the bike for two weeks, so it was pretty hard for me today. The stage wins makes this is a fantastic day." Kittel took the first leader's jersey of the race, and was hopeful - if not confident - of holding it after the following day's team time trial. "The team is motivated and a well-oiled machine," he said. "We can work together very well, we have showed that today. We’ll go and try to keep the jersey, but we’ll not put too much pressure on it." The break of the day came from Staf Scheirlinck (Accent.jobs-Willems Verandas) and Pablo Urtasun (Euskaltel-Euskadi), who escaped early in the stage and managed to open up a lead that peaked at 8’32”. As the peloton woke up shortly after the feedzone however, the duo was pulled in with 75km still to ride as they hit the coastal crosswinds. With the big teams of the peloton keen to protect their leaders from the coastal crosswinds, nobody managed to escape again - although there was a brief attempt from Tim Declerq (Topsport Vlaanderen-Mercator) - and the race was heading for a simple sprint. A crash with two kilometres to go either brought down or delayed a number of the big name sprinters however, and Argos-Shimano pulled the peloton to the line. The 203.9km stage was to cross the flatlands of the southern Netherlands. The course featured nothing in the way of climbing, but the second half would be subject to the wind blowing off the North Sea as it crossed the exposed roads and dykes of Zeeland. Scheirlinck and Urtasun escaped after just two kilometres, and managed to open a huge lead that reached 8’32” with 90km to go but, following the feedzone in Zierikzee, a number of teams began to come forward to pull them back. No one team had taken control, and the peloton was still moving at a relatively relaxed pace, but the time in front was beginning to tell for the two leaders, and their lead was falling steadily. FDJ-BigMat, Saxo Bank-Tinkoff Bank, Rabobank, Lotto-Belisol and RadioShack-Nissan all had men in the working line and, as the pace rose sharply, the gap closed quickly. With 77km to go it was just three minutes and, realising that it was closing too quickly, the peloton eased up a little. Omega Pharma-Quick Step and Rabobank stepped forward however, and started to shut it down again. Meanwhile, up the road, Scheirlinck and Urtasun had all but sat up as they could see the peloton across the flat fields behind them, and it was all over with 75km to go. The sprinters’ teams then began to take control of the peloton, as Argos-Shimano and FDJ-BigMat put themselves on the front, with Katusha taking over. As the peloton crossed the long bridge over the Oosterschelde however, with a strong crosswind coming from the right, numerous teams began to fight for the front as they sought to protect their leaders. As the peloton hit the start of the finishing circuit with 55km to go, and headed inland, things calmed down and the sprinters’ teams came forward again. With 50km to go Rabobank took control, and led the peloton across the Middelburg finish line with 43.8km to go. With the coast approaching again with 39km to go the Saxo Bank-Tinkoff Bank took over, keeping Alberto Contador to the front and out of danger. Several other teams swarmed forward however, and Rabobank took over as the peloton approached the final 30km. Garmin-Sharp came to the front as the race approached the north coast again, and began to split the peloton. Despite the high pace Tim Declerq (Topsport Vlaanderen-Mercator) managed to escape with 21km to go, but the young Belgian wasn’t able to get far ahead and was soon brought back. Team Sky and then Omega Pharma-Quick Step took over, as most of the dropped riders fought to get back on, and began to string out the peloton. The Belgian team led the race into the final nine kilometres, but were pushed back as BMC Racing moved ahead. Into the final five kilometres however, the white jerseys of Argos-Shimano and FDJ-BigMat began to move ahead on one side of the road, with the blue jerseys of Garmin-Sharp on the other. After a brief turn from Orica-GreenEdge, the Rabobank team took over onto the final two kilometres; the peloton was disrupted by a crash halfway back however, and Argos-Shimano came forward in force once again. The Dutch Professional Continental team pulled into the final kilometre, holding off a challenge from Giacomo Nizzolo (RadioShack-Nissan), and Kittel cruised to his first victory since June. FRA 2 Arnaud Demare (Equipe Cycliste FDJ - BigMat) s.t. USA 3 Taylor Phinney (BMC Racing Team) s.t. AUS 4 Heinrich Haussler (Garmin - Sharp) s.t. GBR 5 Adam Blythe (BMC Racing Team) s.t. BEL 6 Michael Van Staeyen (Topsport Vlaanderen - Mercator) s.t. ESP 7 Jose Joaquin Rojas Gil (Movistar Team) s.t. BEL 8 Frederique Robert (Lotto - Belisol Team) s.t. ITA 9 Jacopo Guarnieri (Astana Pro Team) s.t. ITA 10 Giacomo Nizzolo (RadioShack - Nissan) s.t. NOR 11 Alexander Kristoff (Katusha Team) s.t. ITA 12 Davide Appollonio (Sky Procycling) s.t. POL 13 Maciej Bodnar (Liquigas - Cannondale) s.t. GBR 14 Alex Dowsett (Sky Procycling) s.t. NED 15 Stefan Van Dijk (Accent.jobs – Willems Veranda’s) s.t. BEL 16 Tim Declercq (Topsport Vlaanderen - Mercator) s.t. BEL 17 Sep Vanmarcke (Garmin - Sharp) s.t. BEL 18 Tom Boonen (Omega Pharma - Quickstep) s.t. ITA 19 Manuel Belletti (Ag2R - La Mondiale) s.t. ITA 20 Marco Marcato (Vacansoleil - DCM Pro Cycling Team) s.t. FRA 21 Mickaël Delage (Equipe Cycliste FDJ - BigMat) s.t. NED 22 Theo Bos (Rabobank Cycling Team) s.t. GER 23 Rüdiger Selig (Katusha Team) s.t. BEL 24 Tom Van Asbroeck (Topsport Vlaanderen - Mercator) s.t. GER 25 Marcus Burghardt (BMC Racing Team) s.t. ITA 26 Alessandro Petacchi (Lampre - ISD) s.t. BEL 27 Jens Keukeleire (Orica - GreenEDGE) s.t. AUS 28 Adam Leigh Howard (Orica - GreenEDGE) s.t. BEL 29 Laurens De Vreese (Topsport Vlaanderen - Mercator) s.t. ITA 30 Daniele Pietropolli (Lampre - ISD) s.t. AUS 31 Graeme Brown (Rabobank Cycling Team) s.t. ITA 32 Mauro Da Dalto (Liquigas - Cannondale) s.t. BEL 33 Klaas Lodewyck (BMC Racing Team) s.t. LTU 34 Ramunas Navardauskas (Garmin - Sharp) s.t. GER 35 Christian Knees (Sky Procycling) s.t. BEL 36 Pieter Vanspeybrouck (Topsport Vlaanderen - Mercator) s.t. FRA 37 Lloyd Mondory (Ag2R - La Mondiale) s.t. BEL 38 Sjef De Wilde (Accent.jobs – Willems Veranda’s) s.t. FRA 39 William Bonnet (Equipe Cycliste FDJ - BigMat) s.t. NED 40 Tom Veelers (Argos-Shimano) s.t. BEL 41 Bert De Backer (Argos-Shimano) s.t. NED 42 Roy Curvers (Argos-Shimano) s.t. FRA 43 Sylvain Chavanel (Omega Pharma - Quickstep) s.t. AUS 44 David Tanner (Team Saxo Bank - Tinkoff Bank) s.t. BEL 45 James Vanlandschoot (Accent.jobs – Willems Veranda’s) s.t. ESP 46 Pablo Lastras Garcia (Movistar Team) s.t. LAT 47 Gatis Smukulis (Katusha Team) s.t. NED 48 Dennis Van Winden (Rabobank Cycling Team) s.t. BEL 49 Guillaume Van Keirsbulck (Omega Pharma - Quickstep) s.t. FRA 50 David Boucher (Equipe Cycliste FDJ - BigMat) s.t. RUS 51 Pavel Brutt (Katusha Team) s.t. ITA 52 Alessandro Ballan (BMC Racing Team) s.t. ESP 53 Francisco José Ventoso Alberdi (Movistar Team) s.t. ITA 54 Tiziano Dall'antonia (Liquigas - Cannondale) s.t. NED 55 Ramon Sinkeldam (Argos-Shimano) s.t. NED 56 Niki Terpstra (Omega Pharma - Quickstep) s.t. EST 57 Tanel Kangert (Astana Pro Team) s.t. CAN 58 Dominique Rollin (Equipe Cycliste FDJ - BigMat) s.t. JPN 59 Fumiyuki Beppu (Orica - GreenEDGE) s.t. CRC 60 Andrey Amador Bakkazakova (Movistar Team) s.t. POL 61 Michal Kwiatkowski (Omega Pharma - Quickstep) s.t. LUX 62 Jean-pierre Drucker (Accent.jobs – Willems Veranda’s) s.t. GER 63 Andreas Klier (Garmin - Sharp) s.t. FRA 64 Tony Gallopin (RadioShack - Nissan) s.t. NED 65 Sebastian Langeveld (Orica - GreenEDGE) s.t. FRA 66 Steve Chainel (Equipe Cycliste FDJ - BigMat) s.t. BEL 67 Dries Devenyns (Omega Pharma - Quickstep) s.t. GER 68 Robert Wagner (RadioShack - Nissan) s.t. ITA 69 Salvatore Puccio (Sky Procycling) s.t. BEL 70 Jan Bakelants (RadioShack - Nissan) s.t. BEL 71 Jelle Wallays (Topsport Vlaanderen - Mercator) s.t. ITA 72 Manuele Mori (Lampre - ISD) s.t. GER 73 Linus Gerdemann (RadioShack - Nissan) s.t. NED 74 Wouter Mol (Vacansoleil - DCM Pro Cycling Team) s.t. NED 75 Karsten Kroon (Team Saxo Bank - Tinkoff Bank) s.t. CAN 76 Svein Tuft (Orica - GreenEDGE) s.t. ITA 77 Matteo Montaguti (Ag2R - La Mondiale) s.t. ITA 78 Diego Ulissi (Lampre - ISD) s.t. KAZ 79 Valentin Iglinskiy (Astana Pro Team) s.t. NED 80 Martijn Keizer (Vacansoleil - DCM Pro Cycling Team) s.t. ITA 81 Adriano Malori (Lampre - ISD) s.t. FRA 82 Pierre Cazaux (Euskaltel - Euskadi) s.t. BEL 83 Nick Nuyens (Team Saxo Bank - Tinkoff Bank) s.t. ESP 84 Victor Cabedo Carda (Euskaltel - Euskadi) s.t. ITA 85 Manuel Quinziato (BMC Racing Team) s.t. ESP 86 Jonathan Nicolas Castroviejo (Movistar Team) s.t. RUS 87 Mikhail Ignatyev (Katusha Team) s.t. GER 88 John Degenkolb (Argos-Shimano) s.t. SWE 89 Gustav Erik Larsson (Vacansoleil - DCM Pro Cycling Team) s.t. KAZ 90 Dmitriy Gruzdev (Astana Pro Team) s.t. BEL 91 Maarten Neyens (Lotto - Belisol Team) s.t. NED 92 Arnoud Van Groen (Accent.jobs – Willems Veranda’s) s.t. BEL 93 Pieter Jacobs (Topsport Vlaanderen - Mercator) s.t. BEL 94 Greg Van Avermaet (BMC Racing Team) s.t. ESP 95 Benjamin Gonzalez Noval (Team Saxo Bank - Tinkoff Bank) s.t. BEL 96 Gert Dockx (Lotto - Belisol Team) s.t. BEL 97 Tosh Van Der Sande (Lotto - Belisol Team) s.t. GER 98 Danilo Hondo (Lampre - ISD) s.t. BEL 99 Gert Steegmans (Omega Pharma - Quickstep) s.t. ESP 100 Imanol Erviti Ollo (Movistar Team) s.t. BEL 101 Sven Vandousselaere (Topsport Vlaanderen - Mercator) s.t. BEL 102 Ben Hermans (RadioShack - Nissan) s.t. BEL 103 Frederik Veuchelen (Vacansoleil - DCM Pro Cycling Team) s.t. NED 104 Lars Boom (Rabobank Cycling Team) s.t. ESP 105 Alan Lezaun Perez (Euskaltel - Euskadi) s.t. ESP 106 Alberto Contador Velasco (Team Saxo Bank - Tinkoff Bank) s.t. SUI 107 Martin Kohler (BMC Racing Team) s.t. ITA 108 Simone Ponzi (Astana Pro Team) s.t. ESP 109 Markel Irizar Aranburu (RadioShack - Nissan) s.t. ESP 110 Jon Izagirre Insausti (Euskaltel - Euskadi) s.t. POR 111 Nelson Oliveira (RadioShack - Nissan) s.t. SLO 112 Simon Spilak (Katusha Team) s.t. NED 113 Lieuwe Westra (Vacansoleil - DCM Pro Cycling Team) s.t. FRA 114 Sébastien Hinault (Ag2R - La Mondiale) s.t. SUI 115 Martin Elmiger (Ag2R - La Mondiale) s.t. KAZ 116 Sergey Renev (Astana Pro Team) s.t. GER 117 Simon Geschke (Argos-Shimano) s.t. LTU 118 Aidis Kruopis (Orica - GreenEDGE) s.t. LTU 119 Ignatas Konovalovas (Movistar Team) s.t. AUS 120 Luke Durbridge (Orica - GreenEDGE) s.t. FRA 121 Matthieu Ladagnous (Equipe Cycliste FDJ - BigMat) s.t. ITA 122 Daniele Righi (Lampre - ISD) s.t. RUS 123 Evgeni Petrov (Astana Pro Team) s.t. BEL 124 Jurgen Roelandts (Lotto - Belisol Team) s.t. AUS 125 Mark Renshaw (Rabobank Cycling Team) s.t. ITA 126 Daniel Oss (Liquigas - Cannondale) s.t. NED 127 Bram Tankink (Rabobank Cycling Team) s.t. KAZ 128 Dmitriy Muravyev (Astana Pro Team) s.t. BEL 129 Sebastien Rosseler (Garmin - Sharp) s.t. NED 130 Jens Mouris (Orica - GreenEDGE) s.t. GBR 131 David Millar (Garmin - Sharp) s.t. GBR 132 Jeremy Hunt (Sky Procycling) s.t. GER 133 Dominik Nerz (Liquigas - Cannondale) s.t. BEL 134 Kris Boeckmans (Vacansoleil - DCM Pro Cycling Team) s.t. AUS 135 Luke Roberts (Team Saxo Bank - Tinkoff Bank) s.t. BEL 136 Stijn Vandenbergh (Omega Pharma - Quickstep) s.t. BEL 137 Kenny Dehaes (Lotto - Belisol Team) s.t. NZL 138 Jack Bauer (Garmin - Sharp) s.t. ITA 140 Fabio Sabatini (Liquigas - Cannondale) s.t. NED 141 Rick Flens (Rabobank Cycling Team) s.t. ESP 142 Jose Herrada Lopez (Movistar Team) s.t. ITA 143 Matteo Tosatto (Team Saxo Bank - Tinkoff Bank) s.t. RUS 144 Maxim Belkov (Katusha Team) s.t. ITA 145 Matteo Bono (Lampre - ISD) s.t. BEL 146 Jurgen Van Goolen (Accent.jobs – Willems Veranda’s) s.t. BEL 147 Kristof Goddaert (Ag2R - La Mondiale) s.t. ESP 148 Jorge Azanza Soto (Euskaltel - Euskadi) s.t. NED 150 Albert Timmer (Argos-Shimano) s.t. RUS 151 Vladimir Isaychev (Katusha Team) s.t. ITA 152 Manuele Boaro (Team Saxo Bank - Tinkoff Bank) s.t. ESP 153 Adrian Saez De Arregi (Euskaltel - Euskadi) s.t. ESP 154 Pablo Urtasun Perez (Euskaltel - Euskadi) s.t. ITA 155 Federico Canuti (Liquigas - Cannondale) s.t. BEL 156 Jelle Vanendert (Lotto - Belisol Team) s.t. BEL 157 Kevyn Ista (Accent.jobs – Willems Veranda’s) s.t. BEL 158 Sander Cordeel (Lotto - Belisol Team) s.t. NOR 159 Gabriel Rasch (Equipe Cycliste FDJ - BigMat) s.t. NED 160 Raymond Kreder (Garmin - Sharp) s.t. ESP 162 Miguel Minguez (Euskaltel - Euskadi) s.t. RUS 163 Boris Shpilevsky (Ag2R - La Mondiale) s.t. GBR 164 Luke Rowe (Sky Procycling) s.t. LTU 4 Aidis Kruopis (Orica - GreenEDGE) s.t. GBR 7 Luke Rowe (Sky Procycling) s.t. ITA 9 Matteo Montaguti (Ag2R - La Mondiale) s.t. GBR 11 Adam Blythe (BMC Racing Team) s.t. BEL 12 Michael Van Staeyen (Topsport Vlaanderen - Mercator) s.t. ESP 13 Jose Joaquin Rojas Gil (Movistar Team) s.t. BEL 14 Frederique Robert (Lotto - Belisol Team) s.t. ITA 15 Jacopo Guarnieri (Astana Pro Team) s.t. ITA 16 Giacomo Nizzolo (RadioShack - Nissan) s.t. NOR 17 Alexander Kristoff (Katusha Team) s.t. ITA 18 Davide Appollonio (Sky Procycling) s.t. 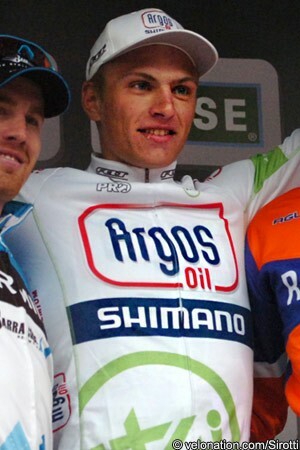 POL 19 Maciej Bodnar (Liquigas - Cannondale) s.t. GBR 20 Alex Dowsett (Sky Procycling) s.t. NED 21 Stefan Van Dijk (Accent.jobs – Willems Veranda’s) s.t. BEL 22 Tim Declercq (Topsport Vlaanderen - Mercator) s.t. BEL 23 Sep Vanmarcke (Garmin - Sharp) s.t. BEL 24 Tom Boonen (Omega Pharma - Quickstep) s.t. ITA 25 Manuel Belletti (Ag2R - La Mondiale) s.t. ITA 26 Marco Marcato (Vacansoleil - DCM Pro Cycling Team) s.t. FRA 27 Mickaël Delage (Equipe Cycliste FDJ - BigMat) s.t. NED 28 Theo Bos (Rabobank Cycling Team) s.t. GER 29 Rüdiger Selig (Katusha Team) s.t. BEL 30 Tom Van Asbroeck (Topsport Vlaanderen - Mercator) s.t. GER 31 Marcus Burghardt (BMC Racing Team) s.t. ITA 32 Alessandro Petacchi (Lampre - ISD) s.t. BEL 33 Jens Keukeleire (Orica - GreenEDGE) s.t. AUS 34 Adam Leigh Howard (Orica - GreenEDGE) s.t. BEL 35 Laurens De Vreese (Topsport Vlaanderen - Mercator) s.t. ITA 36 Daniele Pietropolli (Lampre - ISD) s.t. AUS 37 Graeme Brown (Rabobank Cycling Team) s.t. ITA 38 Mauro Da Dalto (Liquigas - Cannondale) s.t. BEL 39 Klaas Lodewyck (BMC Racing Team) s.t. LTU 40 Ramunas Navardauskas (Garmin - Sharp) s.t. GER 41 Christian Knees (Sky Procycling) s.t. BEL 42 Pieter Vanspeybrouck (Topsport Vlaanderen - Mercator) s.t. FRA 43 Lloyd Mondory (Ag2R - La Mondiale) s.t. BEL 44 Sjef De Wilde (Accent.jobs – Willems Veranda’s) s.t. FRA 45 William Bonnet (Equipe Cycliste FDJ - BigMat) s.t. NED 46 Tom Veelers (Argos-Shimano) s.t. BEL 47 Bert De Backer (Argos-Shimano) s.t. NED 48 Roy Curvers (Argos-Shimano) s.t. FRA 49 Sylvain Chavanel (Omega Pharma - Quickstep) s.t. AUS 50 David Tanner (Team Saxo Bank - Tinkoff Bank) s.t. BEL 51 James Vanlandschoot (Accent.jobs – Willems Veranda’s) s.t. ESP 52 Pablo Lastras Garcia (Movistar Team) s.t. LAT 53 Gatis Smukulis (Katusha Team) s.t. NED 54 Dennis Van Winden (Rabobank Cycling Team) s.t. BEL 55 Guillaume Van Keirsbulck (Omega Pharma - Quickstep) s.t. FRA 56 David Boucher (Equipe Cycliste FDJ - BigMat) s.t. RUS 57 Pavel Brutt (Katusha Team) s.t. ITA 58 Alessandro Ballan (BMC Racing Team) s.t. ITA 59 Tiziano Dall'antonia (Liquigas - Cannondale) s.t. NED 60 Ramon Sinkeldam (Argos-Shimano) s.t. NED 61 Niki Terpstra (Omega Pharma - Quickstep) s.t. EST 62 Tanel Kangert (Astana Pro Team) s.t. CAN 63 Dominique Rollin (Equipe Cycliste FDJ - BigMat) s.t. JPN 64 Fumiyuki Beppu (Orica - GreenEDGE) s.t. CRC 65 Andrey Amador Bakkazakova (Movistar Team) s.t. POL 66 Michal Kwiatkowski (Omega Pharma - Quickstep) s.t. LUX 67 Jean-pierre Drucker (Accent.jobs – Willems Veranda’s) s.t. GER 68 Andreas Klier (Garmin - Sharp) s.t. FRA 69 Tony Gallopin (RadioShack - Nissan) s.t. NED 70 Sebastian Langeveld (Orica - GreenEDGE) s.t. FRA 71 Steve Chainel (Equipe Cycliste FDJ - BigMat) s.t. BEL 72 Dries Devenyns (Omega Pharma - Quickstep) s.t. ITA 73 Salvatore Puccio (Sky Procycling) s.t. BEL 74 Jan Bakelants (RadioShack - Nissan) s.t. BEL 75 Jelle Wallays (Topsport Vlaanderen - Mercator) s.t. ITA 76 Manuele Mori (Lampre - ISD) s.t. GER 77 Linus Gerdemann (RadioShack - Nissan) s.t. NED 78 Karsten Kroon (Team Saxo Bank - Tinkoff Bank) s.t. CAN 79 Svein Tuft (Orica - GreenEDGE) s.t. ITA 80 Diego Ulissi (Lampre - ISD) s.t. KAZ 81 Valentin Iglinskiy (Astana Pro Team) s.t. NED 82 Martijn Keizer (Vacansoleil - DCM Pro Cycling Team) s.t. ITA 83 Adriano Malori (Lampre - ISD) s.t. FRA 84 Pierre Cazaux (Euskaltel - Euskadi) s.t. BEL 85 Nick Nuyens (Team Saxo Bank - Tinkoff Bank) s.t. ESP 86 Victor Cabedo Carda (Euskaltel - Euskadi) s.t. ITA 87 Manuel Quinziato (BMC Racing Team) s.t. ESP 88 Jonathan Nicolas Castroviejo (Movistar Team) s.t. RUS 89 Mikhail Ignatyev (Katusha Team) s.t. GER 90 John Degenkolb (Argos-Shimano) s.t. SWE 91 Gustav Erik Larsson (Vacansoleil - DCM Pro Cycling Team) s.t. KAZ 92 Dmitriy Gruzdev (Astana Pro Team) s.t. BEL 93 Maarten Neyens (Lotto - Belisol Team) s.t. NED 94 Arnoud Van Groen (Accent.jobs – Willems Veranda’s) s.t. BEL 95 Pieter Jacobs (Topsport Vlaanderen - Mercator) s.t. BEL 96 Greg Van Avermaet (BMC Racing Team) s.t. ESP 97 Benjamin Gonzalez Noval (Team Saxo Bank - Tinkoff Bank) s.t. BEL 98 Gert Dockx (Lotto - Belisol Team) s.t. BEL 99 Tosh Van Der Sande (Lotto - Belisol Team) s.t. GER 100 Danilo Hondo (Lampre - ISD) s.t. BEL 101 Gert Steegmans (Omega Pharma - Quickstep) s.t. ESP 102 Imanol Erviti Ollo (Movistar Team) s.t. BEL 103 Sven Vandousselaere (Topsport Vlaanderen - Mercator) s.t. BEL 104 Ben Hermans (RadioShack - Nissan) s.t. BEL 105 Frederik Veuchelen (Vacansoleil - DCM Pro Cycling Team) s.t. NED 106 Lars Boom (Rabobank Cycling Team) s.t. ESP 107 Alan Lezaun Perez (Euskaltel - Euskadi) s.t. ESP 108 Alberto Contador Velasco (Team Saxo Bank - Tinkoff Bank) s.t. SUI 109 Martin Kohler (BMC Racing Team) s.t. ITA 110 Simone Ponzi (Astana Pro Team) s.t. ESP 111 Markel Irizar Aranburu (RadioShack - Nissan) s.t. ESP 112 Jon Izagirre Insausti (Euskaltel - Euskadi) s.t. ITA 113 Giacomo Nizzolo (RadioShack - Nissan) s.t. SLO 114 Simon Spilak (Katusha Team) s.t. NED 115 Lieuwe Westra (Vacansoleil - DCM Pro Cycling Team) s.t. FRA 116 Sébastien Hinault (Ag2R - La Mondiale) s.t. SUI 117 Martin Elmiger (Ag2R - La Mondiale) s.t. KAZ 118 Sergey Renev (Astana Pro Team) s.t. GER 119 Simon Geschke (Argos-Shimano) s.t. LTU 120 Ignatas Konovalovas (Movistar Team) s.t. AUS 121 Luke Durbridge (Orica - GreenEDGE) s.t. FRA 122 Matthieu Ladagnous (Equipe Cycliste FDJ - BigMat) s.t. ITA 123 Daniele Righi (Lampre - ISD) s.t. RUS 124 Evgeni Petrov (Astana Pro Team) s.t. BEL 125 Jurgen Roelandts (Lotto - Belisol Team) s.t. AUS 126 Mark Renshaw (Rabobank Cycling Team) s.t. ITA 127 Daniel Oss (Liquigas - Cannondale) s.t. NED 128 Bram Tankink (Rabobank Cycling Team) s.t. KAZ 129 Dmitriy Muravyev (Astana Pro Team) s.t. BEL 130 Sebastien Rosseler (Garmin - Sharp) s.t. NED 131 Jens Mouris (Orica - GreenEDGE) s.t. GBR 132 David Millar (Garmin - Sharp) s.t. GBR 133 Jeremy Hunt (Sky Procycling) s.t. GER 134 Dominik Nerz (Liquigas - Cannondale) s.t. BEL 135 Kris Boeckmans (Vacansoleil - DCM Pro Cycling Team) s.t. AUS 136 Luke Roberts (Team Saxo Bank - Tinkoff Bank) s.t. BEL 138 Kenny Dehaes (Lotto - Belisol Team) s.t. NZL 139 Jack Bauer (Garmin - Sharp) s.t. NED 140 Raymond Kreder (Garmin - Sharp) s.t. ITA 142 Fabio Sabatini (Liquigas - Cannondale) s.t. NED 143 Rick Flens (Rabobank Cycling Team) s.t. ESP 144 Jesús Lopez Herrada (Movistar Team) s.t. ITA 145 Matteo Tosatto (Team Saxo Bank - Tinkoff Bank) s.t. RUS 146 Maxim Belkov (Katusha Team) s.t. ITA 147 Matteo Bono (Lampre - ISD) s.t. BEL 148 Jurgen Van Goolen (Accent.jobs – Willems Veranda’s) s.t. BEL 149 Kristof Goddaert (Ag2R - La Mondiale) s.t. ESP 150 Jorge Azanza Soto (Euskaltel - Euskadi) s.t. RUS 154 Vladimir Isaychev (Katusha Team) s.t. ITA 155 Manuele Boaro (Team Saxo Bank - Tinkoff Bank) s.t. ESP 156 Adrian Saez De Arregi (Euskaltel - Euskadi) s.t. ITA 157 Federico Canuti (Liquigas - Cannondale) s.t. BEL 158 Jelle Vanendert (Lotto - Belisol Team) s.t. BEL 159 Kevyn Ista (Accent.jobs – Willems Veranda’s) s.t. BEL 160 Sander Cordeel (Lotto - Belisol Team) s.t. NOR 161 Gabriel Rasch (Equipe Cycliste FDJ - BigMat) s.t. ESP 163 Miguel Minguez (Euskaltel - Euskadi) s.t. RUS 164 Boris Shpilevsky (Ag2R - La Mondiale) s.t.